Boy, even that little bit of fortune-telling I did there, in the parentheses …. was wrong. What was I thinking? which is, apparently, on a list of “The 10 Best iPhone and Android Apps for Reducing Anxiety,” published on 9/9/12 by HealthLine. But I still need to define the concept of “Worry Box”. Find any box, decorate it however you like, and keep it in a handy place. 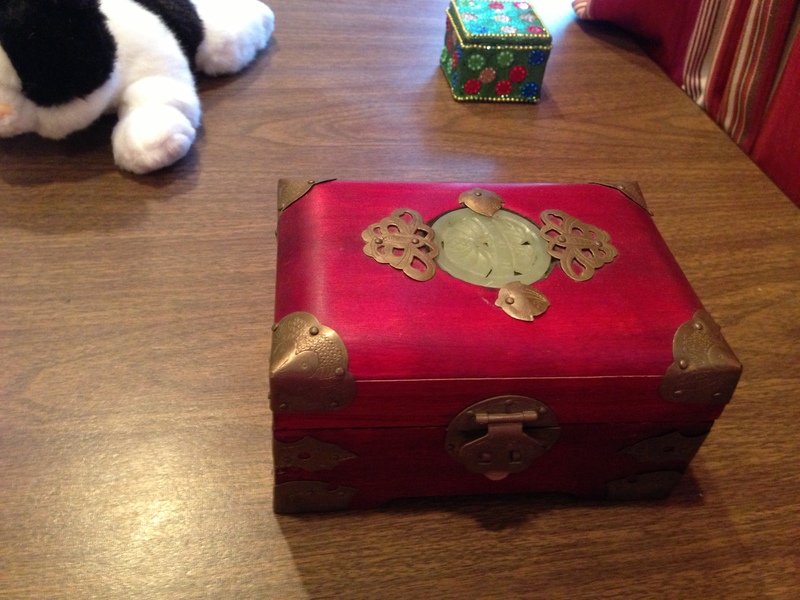 (I found that this was a great activity to do with my young children, since they loved helping to decorate the box.) Jot down each worry as it crops up on a piece of paper and drop it into the box. Once your worry is deposited in the box, try to turn your attention to other matters. 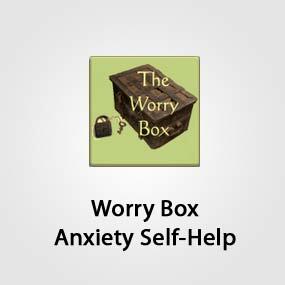 The worry box essentially allows you to mentally let go of your worries. I wanted to write about Worry Boxes, this morning, because I’m having some worries about my trip to England and Scotland with my son, which is ….. about one week away. My worry is right on schedule, based on my Past History of Worrying. Something New (or otherwise scary/exciting) is approaching and is, suddenly, sooner than I expect. I worry that I am not prepared enough. I visualize and otherwise think about things that can go wrong. I forget about all the times I have mastered similar things in the past. I recognize and name my anxiety. I (and sometimes other people) do some work to help me let go of anxiety and worry. I feel secure enough and start looking forward to What Was Causing The Anxiety Before. Go back to Step #1, above. Yep! It’s a cycle, all right. So I figured I would do something new, today, as part of Step #6, above. 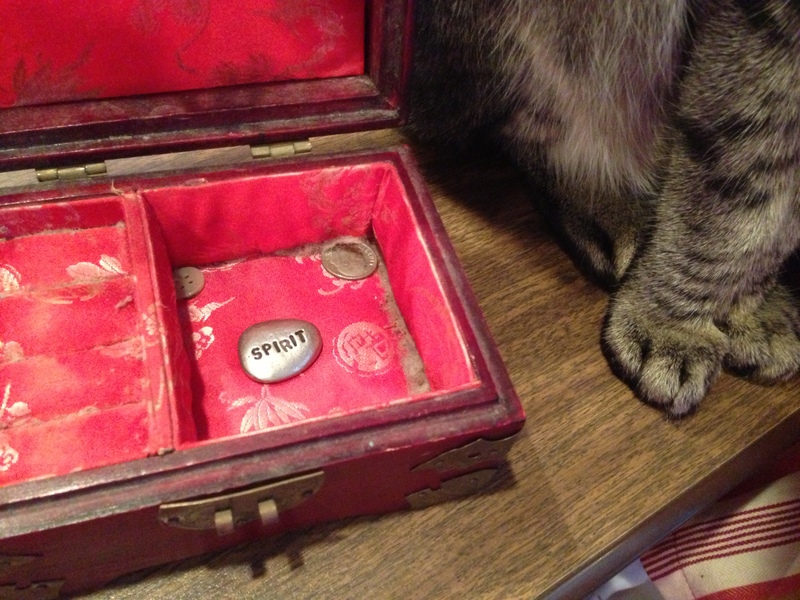 Front row: Worry Box, previously known as Precious Gift from Precious Friend. Back row (left to right): A Monitor Screen Cleaner (partially pictured) (purchased at the same great store where I got the “Trust” cup, pictured here); Emergency Messages Box (described here). The left portion of that photo shows all that was in the newly-dubbed Worry Box, when I opened it up this morning, for the first time, in a long time. On the right: another cat that helps out with computers. Love this!!! What a wonderful idea, The Worry Box. Delivered with a strong psychological lining this can be a really special present for someone in need!! I agree. Thanks for reading and commenting. I certainly agree 110% with heila2013! The Worry Box is a wonderful idea. Definitely going to gift myself a Worry Box!